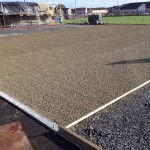 Needlepunch surface dimensions vary depending on a variety of factors, the most important being the function for the sports facility – for example if the surface is being used as a long jump facility in a primary school, the runway would not have to be as long as the runway for a athletics club or even a secondary school. This allows for these sorts of institutions to save money, however bigger schools may want to have multiple runway tracks to allow for more children to use the facility at any one time. This however will mean that the sand pit would have to be bigger to ensure that the children using the surface are completely safe whilst doing so. 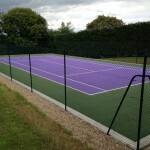 If the sports pitch is a football training ground the size and dimensions can massively vary mainly down to price and budget, you can easily customize the size for your facility to help fit within your budget or allow you to allocate your funds to else where such as floodlighting and fencing. Floodlighting would be a worthy investment for leisure centres as it allows for the institution to rent out the sports pitch even during the evening and night time. 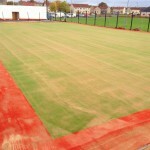 Sizing for needlepunch surfaces are completely in the control of the client, giving them the freedom to design the perfect sports pitch for them and their facility. We aim to allow the client to stick within their budget by giving them the customisation they require to help do so. The biggest factor for the costs of the sports facility is the size of the facility – so allowing for customization here makes a happy customer that sticks within their budget. 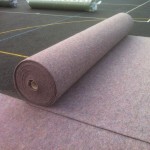 We aim to give you a top quality needlepunch sports facility for a great value price which helps each organisation stick within their budget and ensures they are happy with the overall installation.